Specifying, installing and supporting DATA, VOICE, and MULTIMEDIA connectivity is what you do. Our goal is to help you do your job better, faster and easier. Whether you are an end user, contractor, distributor, reseller or representative, ETS stands ready: We have the service, support and products to make sure your needs are met. 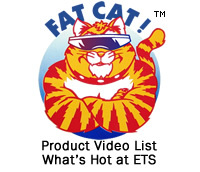 Multimedia solutions available from ETS are Audio/Video, ProVideo, and ProAudio products. Our Multimedia products have been used in the following aplications: Television Broadcast, Production and Recording Studios, Schools, Commercial & Industrial Security, Display Stations & Kiosks, Auditoriums, Media Retrieval Systems, PC Video (SVGA) Distribution, "Smart" Homes, Churches, Hospitals, and much more. ETS Multimedia products address the following signals and media: For video, we cover Baseband, Broadband, Digital, Composite, xVGA and more. On the Audio side, we have products to address Line Level Analog, AES/EBU, Digital signals. All of these products are designed to allow you to work over a variety of physical wiring, from Coax to UTP and STP, converting from one type to another as appropriate to the facility and requirements. Audio/Video - S-Video, xVGA, and Baseband Video with Stereo Audio, both Baluns and Distribution Configurations. ProVideo - Serial Digital Video, Baseband and NTSC, Broadband, RGB, xVGA Baluns and Adapters. ProAudio - Analog Audio adapters, Digital Audio Baluns and Splitters, and specialty Audio products. Ethernet - including the best ICS Baluns, PairSavers (Ethernet using POTS), and ETS's Monoline product family. Carrier Telecom - DS3, E1 and T1 baluns, and Asynchronous Patch Panels. Other Products - Serial Data and Precision Instrumentation Baluns, pair splitters and our Audio and Video transformers & IBM Midrange and Mainframe Connectivity. Other Specialty Products from ETS are selling really well! Our SDS Theater Products have played a major part in almost every Broadway show - they DEMAND the best, most reliable and ETS delivers! Our InstaSnake Audio Products are known worldwide for their quality, durability, and reliability! InstaSnake Audio Products are a compact, lightweight, versatile passive group of components allowing you to run audil signals over a single run of CAT5, 5E, or 6 cables.